This times tables bingo game is a fun way to combine practice of both the 4 and the 5 times tables - working forwards from the questions on the caller cards to the answers on the bingo cards. 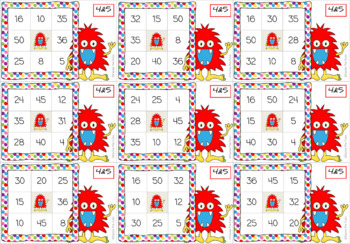 •	26 randomised bingo cards for the 4&5 times tables (with the times table answers). 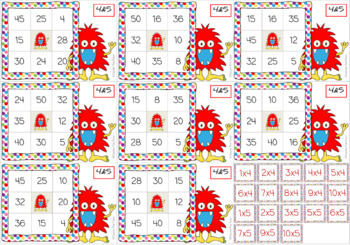 •	18 caller cards (with each of the times tables questions). •	An additional page of caller cards and blank bingo cards should you require them. The game can be played as a whole class, or in smaller groups with a bag of caller cards in the centre of the table. Students can mark off their cards with counters or white board pens - if cards are laminated. 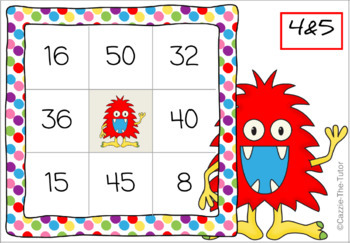 Forwards Monster Bingo for the 1&10, 2&3, 4&5, 6&7 and 8&9 times tables. Or you can bag my Forwards Monster Bingo BUNDLE. 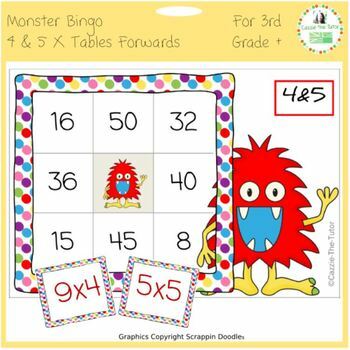 Backwards Monster Bingo for the 1&10, 2&3, 4&5, 6&7, 8&9 times tables - or you can bag my Backwards Monster Bingo Bundle.